Dr. William Evans offers diagnostic and therapeutic care for conditions involving the GI tract, pancreas, and liver. He provides his patients with comprehensive care that has been honed through years of specialized training and experience. On this episode of KET’s Kentucky Health, Dr. Evans thoroughly discusses the pancreas as well as pancreatitis. The pancreas is an organ that aids in the digestion of food. Located behind the stomach and deep in the abdomen, inflammation of the pancreas can affect all the important organs that surround it and even cause paralysis of the intestines. The two main functions of the pancreas are to regulate blood sugar and to make a enzyme fluid that helps digest any proteins or fats that are consumed. Pancreatitis is a disease that occurs when the pancreas becomes inflamed. Anyone can have acute pancreatitis. The most common cause of acute pancreatitis is trapped gallstones blocking the flow of pancreatic juice. In acute pancreatitis, inflammation can be so profound that the organ digests itself. Long term complications include a severe episode where one must be admitted to a hospital and kept for a few days, the death of the pancreas itself, a build up fluid that can become infected, as well as an impact on multiple other organs. Chronic pancreatitis is most commonly associated with risk factors such as regular alcohol or tobacco use. Chronic pancreatitis can take months to develop and is often asymptomatic. 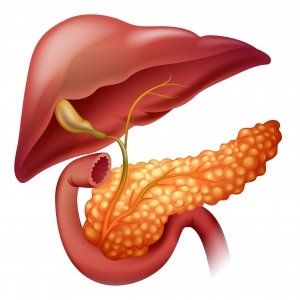 In chronic pancreatitis cases, scar tissue builds up in the pancreas surrounding the nerves and causing pain. Overtime, one can lose function of the gland as well as the ability to digest food, and are at an increased risk for diabetes as well as pancreatic cancer. Pancreatic cancer is the 4th leading cause of cancer related deaths in the United States affecting those 45 or older. Signs of pancreatitis cancer include unexplained weight loss, a history of smoking, no obvious cause of pancreatitis, and a family history of the disease. Diagnosing pancreatitis often involves a basic exam, medical history, lab work and imaging. A CT scan of the abdomen can show if a stone is causing blockage or if a tumor is present. If a gallstone is a factor, an endoscopy may be required. With little if any food intake, pancreatitis usually takes 3-5 days to resolve, and an additional 6 weeks for the pancreas itself to normalize. In order to avoid pancreatitis, abstaining from smoking and drinking is recommended. Educating one’s self on gallstones is also a helpful resource in preventative care, as one can have them removed if they become problematic. Dr. William Evans earned his Medical degree from St. George’s University School of Medicine in Grenada, West Indies. He completed his clinical training at the University of Louisville, where he completed an Internship, a Residency in Internal Medicine, and Fellowship in Gastroenterology. During his fellowship training, Dr. Evans also earned a Masters in Science & Clinical Investigation at the University of Louisville School of Public Health & Information Sciences. Dr. Evans went on to complete a second Fellowship in Therapeutic Endoscopy at the University of Florida College of Medicine in Gainesville, Florida.